The Garden Grill Restaurant is our selection for #Day30 in our #DisneyWorldCountdown! Hello everyone, and welcome to #Day30 in our #DisneyWorldCountdown! Today we are taking a look at one of my favorite restaurants in all of Disney — the Garden Grill Restaurant, located inside the Land Pavilion at Epcot’s Future World. This restaurant is situated above the Living with the Land Boat ride, and the restaurant slowly spins so that you can see all of the outdoor seasons that are depicted in the ride below. It’s a lot of fun, and my family eats here almost every trip. I love just about everything that this restaurant represents — great food, a unique twist (no pun intended) with the revolving restaurant, character interactions with Chip and Dale, and Mickey Mouse and Pluto, and wholesome vegetables that are prepared from vegetables that are grown right below the restaurant in the hydroponic greenhouses that are part of the tour (among other places). All in all, this restaurant is at the top of the list for me. The Garden Grill Restaurant features Chip & Dale and usually includes Mickey Mouse & Pluto too! 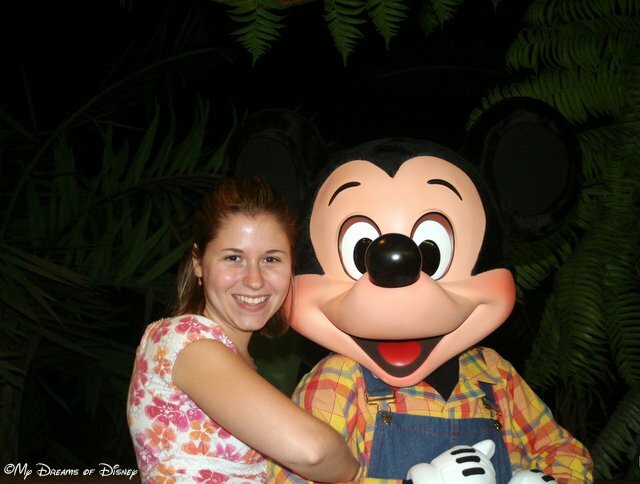 As you can see, Mickey Mouse loves to have his picture taken with Guests! 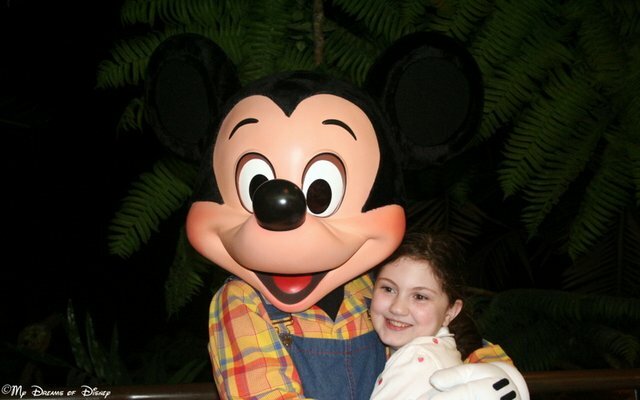 As you can see, Mickey loves to have his picture taken with Guests! Both Sophie and Stephanie had their pictures taken this year! The menu at the Garden Grill is diverse. Everything is served family style, with a beef dish and accompanying vegetables, a turkey dish with accompanying vegetables, a fish dish with accompanying vegetables, a great salad, wonderful warm bread with an orange honey butter, and a wonderful dessert! Yummy! Here is the menu in case you wish to check it out for yourself. The Garden Grill Restaurant is also on the Disney Dining Plan, and costs just one table service credit per person. Additionally, they do accept the Tables in Wonderland discount card as well. What do you think of the restaurant? Have you ever eaten there before? Let me know in the comments, and thanks for stopping by!